How to get there The climb starts already down in Albertville (346m) and you follow through Beaufort (740m) and take off at the same place (760m) as you would if you came down from (Col du) Cormet de Roselend (1969m). Shortest then is to take the road that stays on the right hand side of the valley until meeting the other road just before the final steep and long finish to the pass. If you come down from Col des Saisies (1658m), an almost flat road starts from Hauteluce (1104m) and eventually take you to the same steep section that starts from 1215m and in just under 10 km takes you to the pass. Other comments It can be a very hot climb. The road is narrow in the last 10 km and there is some traffic up to the restaurant at the top, where many people start out on walks on the Tour du Mont Blanc. 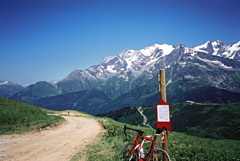 The views over the Mont Blanc mountains are very good at the pass height! The beauty points are mostly for the views at the top as otherwise it is just a sweet typical northern Alps pass road. There is no water on the last 10 km. The gravel roads from the northeast are not possible to cycle all the way with a road bike according to reports.